The alliance between the FAC and CC provides us the resources and opportunities to develop, implement and research new and adventurous approaches to teaching and learning in the arts. Below are some of those opportunities. We want to be a resource for you as an educator and encourage onsite and off site learning about the arts. If you have questions for us that are not answered here, please reach out to our education department at fac@coloradocollege.edu. The buzz of an alarm signifying a new day, the smell of freshly brewed coffee, the turning of a key in a car ignition, the wheels of a bike moving in smooth repetition, and music and stories filling our ears as we make our daily commutes. Innovative ideas, methods and practices shape and inspire the world in which we live. Each day, we experience the contributions of great leaders, thinkers and doers that make our lives more efficient, safer, gratifying and full of creativity. Native Knowledge 360° (NK360°) provides educators and students with new perspectives on Native American history and cultures. NK360° provides educational materials and teacher training that incorporate Native narratives, more comprehensive histories, and accurate information to enlighten and inform teaching and learning about Native America. NK360° challenges common assumptions about Native peoples—their cultures, their roles in United States and world history, and their contributions to the arts, sciences, and literature. Enrich the minds and imaginations of your students with the ageless power of art. We offer a variety of FREE tour options for educational groups of all ages, sizes, and abilities. Did you know that in addition to our special educator workshops, the the Fine Arts Center’s Bemis Art School offers certificates of completion for art classes. Often these hours qualify for professional development hours that must be maintained as a teacher. We offer Gifted and Talented in Art programs for School District 11, for grades 3-5. For over 25 years we have offered programs to teach high levels of art standards. Multiple week art classes in varied mediums culminate in an art show and reception for the students who participate. 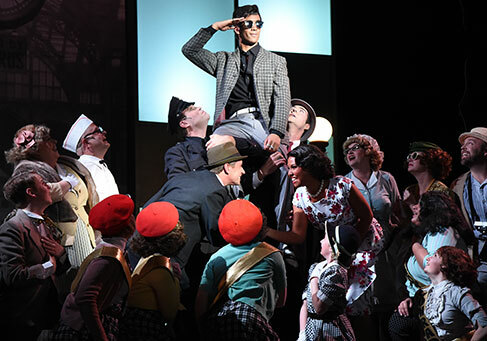 The award-winning and critically-acclaimed Fine Arts Center Theatre Company produces an annual season of musicals, comedies and dramas. Bring classes and groups to our student matinées for an enriching experience to last a lifetime. The variety of theatre experiences will leave your students wanting more!